This workwear jacket will definitely become a favourite go-to garment in your wardrobe. It’s so easy to style and throw on over dresses and jeans. Inspired by classic workwear, each seam of this simple but stylish jacket is topstitched or enclosed to hold up for a lifetime. This unlined button-up chore jacket features one front chest pocket, two front hand pockets, buttoned cuffs and a real knack for getting things done. Julien’s boxy fit is perfect for layering with other garments such as a lovely knit dress. 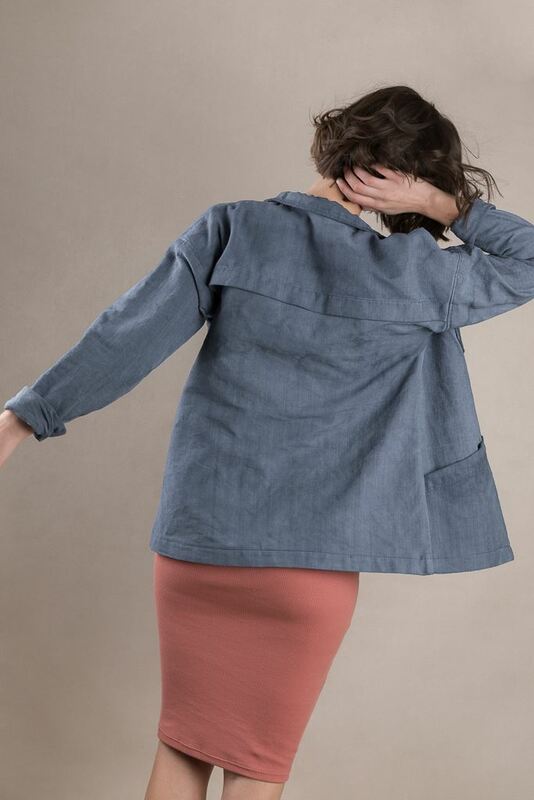 The jacket sewing pattern is rated as for intermediate sewers but has a very simple approach used to achieve ordinarily quite challenging techniques such as creating the back pleat, button placket and sleeve openings. The most challenging part is the collar. It is a great pattern for an advanced beginner trying to stretch her skills with very detailed instructions. The jacket comes in sizes 32 - 52 and has half sizes too 32 - 52 and is perfect for cotton canvas, cotton denim, moleskin, linen and corduroy fabrics.